Family Night for K-3rd Grade on Dec. 10. Come join us for a celebration of Christmas! Children in kindergarten through third grade are invited to the library for Family Night, which will be held at 6:30 p.m. on Monday, December 10 in the Draughon Room (lower level of the library). 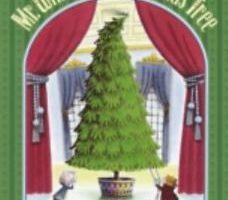 We will be reading Mr. Willowby’s Christmas Tree and The Christmas Boot, making Santa’s laundry line craft, playing games and enjoying refreshments.